The two definitions are similar and have three words in common; profit, risk and initiative. The two definitions also emphasise the exercise of a high degree of initiative and a willingness to take high risks as attributes that sets apart an entrepreneur from the ordinary person in any society. This exploitation of change to create value, is what is often referred to as innovation and is an essential tool for every entrepreneur. He or she identifies a commercial opportunity and then exploit it. They see opportunities where others don’t. Today, most countries, both developed and underdeveloped, have come to recognize and embrace entrepreneurship as a necessity to the development of a healthy, vibrant and competitive economy. In the developing world, a good example of a country that has benefited from embracing entrepreneurship is Rwanda. This is a country whose population and institutions had been decimated by genocide in the 1990s. Today through a deliberate effort by the Rwandan Government to promote entrepreneurship, the country has made a spectacular leap on the latest ‘Ease of Doing Business’ ranking from the World Bank, from 143rd on the list to 67th and its per capital Gross Domestic Product (GDP) has almost quadrupled since 1995. This remarkable achievement has only been possible because of the commitment and consistence by the Government working with the private sector and other stake holders in a coordinated execution of the agreed programmes to promote an entrepreneurship ecosystem in the country. By ecosystem, it is meant a set of individual elements such as leadership, culture, capital markets etc. that combine in a complex way to drive the entrepreneurship engine forward. In isolation, each element is to entrepreneurship but insufficient to sustain it. Together, however, these elements turbo-charge venture creation and growth. It worth repeating that governments must be in the forefront in building environments that nurture and sustain entrepreneurship while working with the private and non-profit sectors, and using, as much as possible, home grown solutions- ones based on the realities of their own circumstances, be they natural resources, geographic location or culture. It is said that there is no exact formula for creating an entrepreneurial economy, there are only practical if not imperfect road maps. Serious governments must therefore be prepared to exploit all available experiences and commit to ongoing experimentation as there is no magic wand to come to their aid. It has to be admitted that compared to countries like Rwanda and even Botswana next door, Zambia has a long way to go in creating a favorable or conducive environment that nurture entrepreneurship among its citizen. With the comparatively high literacy levels that the country has attained, there must be thousands if not millions of potential entrepreneurs out there waiting to blossom, given the right environment. 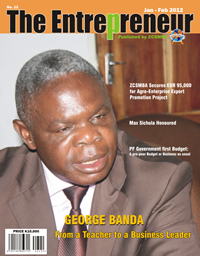 That Zambians have what it takes to become successful entrepreneurs is borne out of the fact that there are many of them in countries where a conducive environment for entrepreneurship development exists, who have taken advantage of this and become very successful entrepreneurs in their own right. As pointed out earlier, to create the kind of environment that promotes entrepreneurship, it not enough to provide one element of the entrepreneurship ecosystem. Zambia needs to go beyond the provision of one or two incentives in the Zambia Development Agency (ZDA) act to nurture entrepreneurship. A total package of a number of elements such as financial support, skills training and upgrading, coaching, counseling and hand-holding; policy and regulatory reform, infrastructure in form of industrial parks, incubators etc, all properly coordinated is what is required in order to nurture and grow successful entrepreneurs. The author is former Executive Secretary of the Zambia Chamber of Small and Medium Business Associations (ZCSMBA).